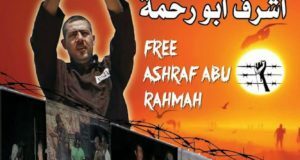 UPDATE: Ashraf Abu Rahme was released from Israeli enforced detention yesterday (3rd June) after 8000 NIS bail was paid on behalf of him, yet he remains under house arrest. 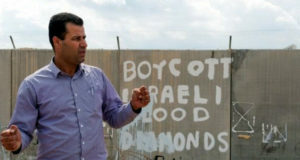 On Monday 26th May, Israeli settlers from the Matityahu East settlement, protected by the Israeli army, started construction work looking to expand their settlement further onto the village of Bil’in’s land. Bil’in residents, joined by international and Israeli activists, attempted to block this construction. Ashraf Abu Rahme of Bil’in known to many as Dabaa, managed to scale one of the settler cranes, holding a Palestinian flag. He remained there and succeeded in stopping the work for six hours before being forced down and arrested by Israeli police. 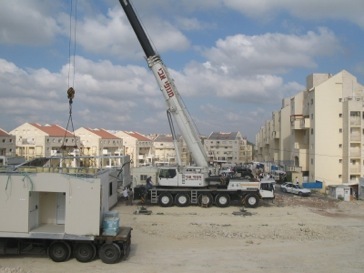 Despite the fact that Despite the the first Phase of the roadmap requires the Government of Israel freeze all settlement activity the Government, including natural growth, the Israeli civil administration (the administrative wing of the occupation) granted permits for the expansion of the outpost of Matityahu East. Six new caravans have been placed on Bil’in land. 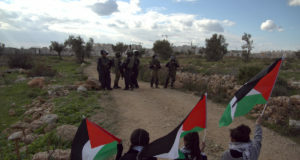 Settlers assaulted the Al Jazeera film crew, and the international and Israeli activists who came to protest the construction. One of the settlers was arrested by the Israeli Police after attempting to bash an international activist head with a rock. When settlers attempted a similar action on the 1st January 2008, two of the Bil’in Popular Committee were hospitalised as settlers attacked them for attempting to block the illegal construction (click here to view video).